For investors to achieve – and retain – healthy long-term returns, we think an active re-balancing policy is essential. It can be hard to hold your nerve when investing in the stock market. Share price gyrations, sudden market drops and fear of missing out can unsettle the steeliest investor. Such tribulations can undermine the discipline needed to make the regular savings needed to build a nest egg for the future. So how should the long-term investor gain and retain the returns they need? We think no serious investor can ignore diversification. By building a portfolio of several types of assets, such as equities and bonds, you can increase the odds that at least one of them will be working hard when the others aren’t. But maintaining the necessary diversity of assets is not something that can be left to chance. Our research suggests that the successful investor needs to intervene occasionally to keep the right balance between the different assets they have chosen. Why is balance so important? In effect, investors should be prepared to accept lower returns if those returns are more reliable. The problem is that many investors often fail to appreciate the risks they have taken to achieve higher returns. Attaining good “risk-adjusted” returns means maintaining the right proportion of those assets that provide growth, balanced against the right proportion that will provide security. What happens when there is no rebalancing? The next step is realise the importance of tweaking a diversified portfolio, known as rebalancing. Say equities make up 75% of a portfolio but then have a good run while other assets languish. That equities portion may end up making up 80% of the portfolio. The idea of rebalancing is that you sell until the equities are back to a 75% portion. You end up selling assets that have performed well and buying ones that haven’t, which would seem prudent. We decided to run some scenarios to find out how rebalancing, and not rebalancing, would have affected outcomes – the returns achieved versus the risks taken. We used one of the simplest of diversified portfolios split 60% in shares – to provide the growth – and 40% in bonds – to provide the security. While an investor might start with this division, stockmarket movements mean that it will almost certainly move away from the original “60/40” allocation. We looked at how it would have fared in two 10-year periods, 1990-2000 and 2000-2010, with no intervention. We found that a 60/40 portfolio in 1990 would have ended up divided 75/25 by 2000. On the other hand, a 60/40 allocation in 2000 would have become 45% equities and 55% bonds by the end of the decade. In both cases, the better-performing asset class came to dominate the portfolio. That may well have worked well in terms of returns, but it would have shifted the risks drastically compared to the original asset allocation. 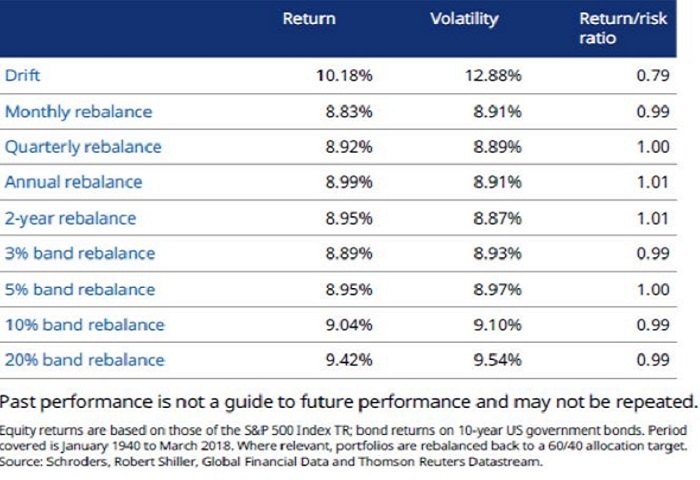 Why is an unbalanced portfolio more risky? Seduced by high returns, an investor might be tempted to leave a portfolio of high-performing shares or equity funds to grow. The problem is that they may also end up dangerously exposed. The results can be both painful and swift. Perhaps the most traumatic illustration was in 1974, when the FTSE All-Share Index fell by more than 70% – very bad news for anyone holding a UK share portfolio. Black Monday in October 1987 wasn’t that great either: by the end of the month, the US Dow Jones Industrial Average was down by 22% and the UK market was off by 26%. In 2008, the year when the credit crunch kicked in, the FTSE 100 index fell by 31%. And although they are more secure than equities, bonds can suffer too: in 1994 unexpected interest rate rises by the US Federal Reserve helped to wipe a cool $1.5 trillion from world bond markets. It is true that markets do come back from such losses, but it often requires a strong stomach to last the journey. For an investor, not having all your eggs in one basket can both protect your wealth and give you the confidence to stay aboard. The main rebalancing approaches are either “periodic”, based on set time intervals such as every quarter, or when differences in performance cause the asset allocation to drift away from its target by more than a certain percentage. This is known as “band” or “range” rebalancing. We tested nine rebalancing portfolios and one with none, our “drift” portfolio. In terms of absolute returns, the drift portfolio performed best, with a 10% annual return. However in risk-adjusted terms, which we defined as annualised returns divided by annualised volatility, it performed the worst. Indeed, every portfolio which used a rebalancing policy, be it periodic or range based, outperformed the drift portfolio in risk-adjusted terms (see chart). Doesn’t regular rebalancing incur costs? It is true that regularly buying and selling assets is a more costly strategy than leaving a portfolio alone. As well as commissions paid to brokers, there is generally a spread between selling and buying prices that works against the frequent trader. For the purposes of our illustration, we have ignored such costs, but we acknowledge that they can be substantial enough to outweigh the benefits of rebalancing. Choosing the optimum rebalancing strategy therefore involves a trade-off between the best risk-adjusted returns and the lowest level of costs consistent with achieving those returns. Is rebalancing just an automatic process? In short, no. Our research shows clearly that, while a rebalancing strategy should follow set rules, it also necessarily requires judgement. Not only do investors have to decide whether to rebalance or not, but also how frequently, the target allocation and the way the strategy should be implemented, among other things. Having the expertise to time rebalancing strategies based on economic environments is more difficult, but our experience suggests that having such a policy in place should help greatly during times of market stress. We conclude that, even when markets are doing well, rebalancing produces superior risk-adjusted returns compared with doing nothing. As an integral part of the investment process, rebalancing should therefore bring rigour and discipline to the construction of the portfolio, while providing free long-run risk management. This is a combination that should commend itself to all investors, allowing them to sleep that bit easier at night and perhaps giving them the confidence to continue to build their savings. A will is a witnessed document that sets out in writing the deceased’s wishes for his or her possessions, (called his or her ‘estate’), after death. It is important for you to make a will because if you do not, and die without a will, the law on intestacy decides what happens to your property. A will can ensure that proper arrangements are made for your dependents and that your property is distributed in the way you wish after you die, subject to certain rights of spouses/civil partners and children. It is also advisable to complete and keep updated a list of your assets. It will make it easier to identify and trace your assets after you die. You should keep the list in a safe place (home safe, Solicitors office etc.). A person who dies having made a valid will is said to have died ‘testate‘. If you die testate, then all your possessions will be distributed in the way you set out in your will. It is the job of the executor or executors you named in your will to make sure this happens. An executor can also be a beneficiary under the will. After you die, somebody will organise your estate, by identifying your assets and possessions, paying any debts you owe and then distributing what is left to the people who are entitled to it. If you have arranged a will before you die, one or more of the executors you named in your will usually has to get legal permission from the Probate Office or the District Probate Registry for the area in which you lived at the time of death to do this. Permission comes in the form of a document called a Grant of Representation. If you did not name any executors in your will or if the executors are unable or unwilling to apply for a Grant of Representation, documents called Letters of Administration (With Will) are issued. When your estate is distributed, the legal rights of your spouse/civil partner and children, if any, will be fulfilled first after any debts are paid before any other gifts are considered. A person who dies without a will is said to have died ‘intestate‘. If you die intestate, this means your estate, is distributed in accordance with the law by an administrator. To do this, the administrator needs permission in the form of a Grant of Representation. When a person dies without a will or when their will is invalid, this Grant is issued as Letters of Administration by the Probate Office or the District Probate Registry for the area in which the person lived at the time of death. It is therefore highly advisable that you organise your Will if you have not done so already. Power of attorney is a legal device in Ireland that can be set up by a person (the donor) during his/her life when he/she is in good mental health. It allows another specially appointed person (the attorney) to take actions on the donor’s behalf if he/she is absent, abroad or incapacitated through illness. If someone in Ireland is mentally incapacitated (for example, because of illness, disability or a progressive degenerative illness), all of their assets and property are normally frozen and cannot be used by anyone else unless they are jointly owned or, someone has power of attorney to deal with their property or money. In a larger sense, power of attorney is just one of the legal arrangements that you can make during your lifetime, in the event you become incapacitated or unable to deal with your affairs. Enduring power of attorney which takes effect on the incapacity of the donor. A power of attorney can be specific (limited to a particular purpose, for example, sale of your house in your absence) or general (entitling the attorney to do almost everything that you yourself could do). For example, it may allow the attorney to take a wide range of actions on the donor’s behalf in relation to property, business, and financial affairs. He/she may make payments from specified accounts, make appropriate provision for any specified person’s needs, and make appropriate gifts to the donor’s relations or friends. An enduring power of attorney (EPA) also allows the attorney to make “personal care decisions” on the donor’s behalf once he/she is no longer fully mentally capable of taking decisions themselves. Personal care decisions may include deciding where and with whom the donor will live, who he/she should see or not see and what training or rehabilitation he/she should get. However, if the donor wants, he/she can specifically exclude any of these powers when setting up the power of attorney or can make the attorney’s powers subject to any reasonable conditions and restrictions. Both cease on the death of the donor. The setting up of legal solutions can be complex at times. Therefore detailed legal advice should be sought in advance. The sooner you act to organise your affairs, the better it will be for your dependents / family in due course. Disclaimer: All data and information provided within this article are for informational purposes only. MBC Financial Limited makes no representations as to accuracy, completeness, suitability, or validity of any information and will not be liable for any errors, omissions or delays in this information or any losses, injuries, or damages arising from its use. Please seek independent professional legal advice. ‘Compounding’ can have a dramatic effect on returns. We highlight the difference it has made for major stock markets. Reinvesting dividends is one of the most powerful tools available for boosting returns over time. Investors in the MSCI World would certainly have noticed the difference over the last 25 years. For instance, if you had invested $1,000 on 01 January 1993 in the MSCI World, the capital growth would have produced a notional return of $3,231 (by 7 March 2018). Annually, that represents a growth rate of 5.9%. The reason for this stark difference in returns is the compounding effect, where you earn returns on your returns. This can snowball over time to produce far more than you might expect. The same story has been repeated across many stockmarkets in the past 25 years. As the table below shows, if you invested in the FTSE 100 you could have almost doubled your returns by reinvesting dividends. In China reinvesting dividends might have been the difference between making a profit and a loss. Each index would have returned more if you reinvested dividends. Overall, the average annual growth across eight markets without dividend reinvestment was 4.3%. Including dividend reinvestment increased the average to 7.1%. However, returns have fluctuated for each index year-on-year in much the same way as the MSCI World Index illustrated in the chart above. Stockmarket investing carries a high degree of risk and past performance is no guide to future performance and may not be repeated. Please remember past performance is not a guide to future performance and may not be repeated. The value of investments and the income from them may go down as well as up and investors may not get back the amounts originally invested. Source: Schroders. Thomson Reuters data correct as at 07 March 2018. Returns based on local currency. Low interest rates, part of the measures deployed by central banks to revive flagging Western economies following the global financial crisis, have driven down yields on more traditional sources of income such as government bonds (gilts) and savings accounts. Interest rates, and government bond yields, across much of the developed world remain near historic lows. For example, yields on 10-year benchmark government debt in the UK, Germany, and Japan are 1.54%, 0.67% and 0.03% respectively, according to Thomson Reuters data. The yield on US government debt is a little higher at 2.88%. But compare that with 25 years ago, the starting point of our dividend data, and it’s starkly different: all four bonds were yielding more than 4.5% in 1993. By comparison, the dividend yield on the FTSE 100 is now 4.1%. In the US it is 3% and in Japan it is 2%. This is why income-hungry investors have turned their attention to stockmarket dividends. The chart below shows global government bond returns over the last 25 years. If you had invested $1,000 on 01 January 1993 in government bonds, as measured by the BofAML Global Government Total Return Index (including interest payments), the capital growth would have produced a notional return of $2,548 (by 7 March 2018). Annually, that represents a growth rate of 5.1%. Why could dividend reinvestment be effective? When purchasing a share, investors can elect how they will receive any future dividends. They can choose to receive cash, referred to as income, or use that money to repurchase more company shares. Investors must elect to repurchase more shares to trigger the start of a process Albert Einstein called “the eighth wonder of the world”: the miracle effect of compounding. Compound interest, put simply, is interest on interest and it can help an investment grow at a faster rate. By reinvesting dividends, you give your stock holding the potential to earn even more dividends in the future. Of course, the value of compounding increases over time, accelerating shareholder value, especially when share prices increase. It is important to remember companies do not have to pay dividends and dividends can be cut or cancelled at any time. Some companies even borrow money to pay dividends, to keep investors happy. This is not always a sustainable approach. Borrowing money to pay a dividend could be a symptom of a company with a weak balance sheet. It is advised that investors do their due diligence before they make any investment. “Dividend reinvestment is one of the most powerful investment tools available. As our research shows, the potential difference to the rate of return dividend reinvestment makes could be substantial. “In an era where interest rates are so low investors need to be aware of relatively simple investment techniques that can help them build up their returns. Dividend reinvestment is a simple technique. “Over time, those seemingly small amounts reinvested can grow into much bigger sums if you use them to buy even more shares that pay dividends in turn. “Investors need to do their research and make sure the company they are investing in can afford to pay their dividends on a sustainable basis. Your original capital is also at risk, so it pays to be picky. A look back at markets in February 2018 when global equity markets retreated as volatility returned. Schroders research, covering four decades of data, shows how different types of bond have performed when rates were rising. Rising interest rates and tighter monetary policies are firmly on the agenda globally. The US Federal Reserve in particular has been paving the path for hiking interest rates and many investors expect at least three further rate hikes this year. In the UK, the Bank of England raised its interest rates for the first time in a decade back in November. In other parts of the world, the European Central Bank and Bank of Japan have begun gradually withdrawing from their respective quantitative easing (QE) programmes. Many are therefore expecting government bond yields to rise and due to the inverse relationship between yields and prices (as yields increase, prices fall), investors have become nervous about fixed income investments, including credit assets. But these fears may be overblown. When we talk about credit, we refer to the likes of investment grade bonds (issued by more creditworthy companies), high yield bonds (issued by less creditworthy companies, but offering more return and income in exchange), and emerging market bonds. In September last year, we looked into past episodes of rising rates in the period between 1970 and early 2017 and how returns were affected. 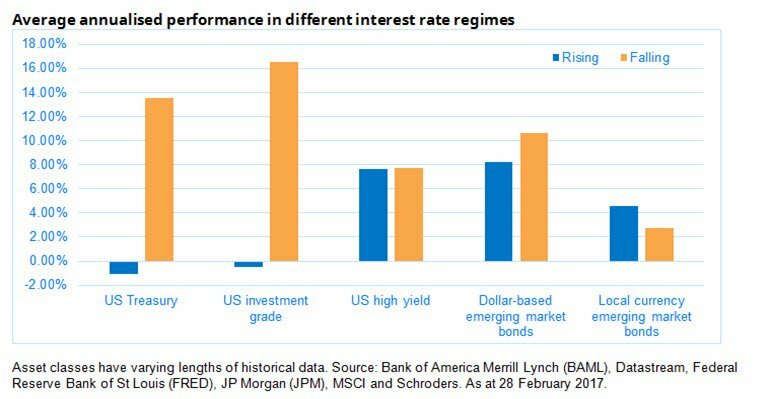 We focused on the US and emerging markets, measuring returns for bonds priced in dollars and in local currencies. Income assets produced positive returns, on average, in rising rate environments, with the exception of government and corporate bonds. Government bonds, such as US Treasuries, and investment grade corporate bonds have performed far worse when yields have been rising than when they have been falling. Many other assets typically included in income portfolios have held up well, and some have actually performed better, when yields have been rising. These conclusions should provide comfort for credit investors. As interest rates tends to rise in anticipation of stronger economic growth, assets which are more sensitive to economic growth (such as high yield debt) can still perform well. As corporate fundamentals usually also improve, this provides a boost to company profits and improves the creditworthiness of borrowers, supporting their corporate bonds. The variation in performance of these assets, combined with the fact that most returns have been positive during rising yield environments, underlines the importance of asset allocation during times of rising rates. If investors can combine savvy asset allocation with an awareness of credit assets’ behaviour when rates rise, then they may be able to add value even when the going looks tough and the temptation might otherwise be to sell. Investors should also remind themselves about the purpose of holding credit as part of their portfolio. If it is solely for returns, then shrewd asset allocation is needed when rates are rising. If it is to generate a level of income, which has been the case over the last few years, due to low interest rates, then investors need not necessarily panic as the impact of rising interest rates on income levels has been minimal. Companies are loath to cut dividends, given the negative signal that it sends to the market, while coupons on bonds are one of the first claims on a company’s income, ranking above other demands. In all this it is important to remember that, like any other asset class, investing in bonds requires an adequate time horizon. Being patient and not panicking when interest rates go up is integral to this strategy. 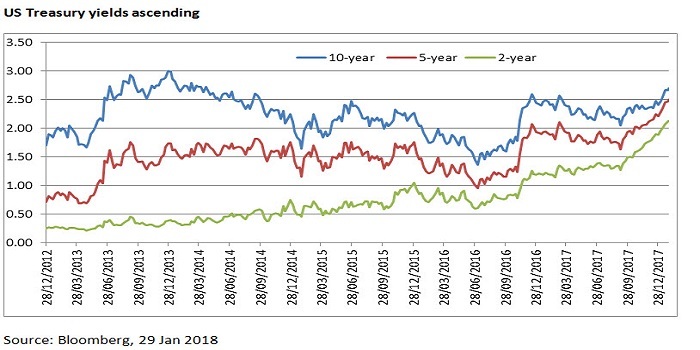 US Treasury (UST) yields have risen 30 basis points (bps) since the start of 2018, across different maturity levels. We have to go back to 2014 for the last time 10-year yields were at these levels (see chart below). This has led to suggestions, including from veteran bond investor Bill Gross, that a near 30-year bull market in government bonds may be over. Prior to January’s developments, the UST curve had undergone a significant flattening in Q4 2017. In other words, the difference in yields on bonds of shorter and longer-dated maturities fell, and quite markedly. Two-year yields increased from 1.48% to 1.89% over the final three months of last year. This would likely reflect higher growth and inflation expectations, and expectations of faster rate hikes, following the US tax reform bill. The US Tax Cuts and Jobs Act 2017 passed in December and economists estimate it could boost US GDP in 2018 by 0.4%-0.8%. It appears markets had been pricing too low a probability of a tax bill and as a result underestimating the trajectory of US interest rates. The US dollar index, which measures the dollar’s strength against a basket of six other major currencies, lost around 9.1% in 2017. Having seen some stabilisation in the fourth quarter, it has resumed this weakening trend in January 2018. Recent comments from US officials regarding trade are a likely factor behind this. So too the pick-up in activity outside of the US, and increasing expectations for a tightening in monetary policy in the eurozone and Japan. The Economics team has noted previously that currencies tend to move ahead of interest rates as investors adjust their expected returns. Seen in this light, the current US dollar weakness could be viewed as an unwinding of the period of strength seen between 2014-2016. While the currency no longer trades near the top of its range, as it did 12-months ago, it remains above its long-term average. Other measures such as purchasing power parity (PPP), which compares different currencies against a basket of goods, also suggest that the dollar may continue to weaken. Much has been made of the drastic reductions to corporate tax that President Donald Trump signed into law in December last year, particularly the potential positive impact on growth. Indeed, already-buoyant markets rose further on the news reflecting more optimistic growth assumptions. 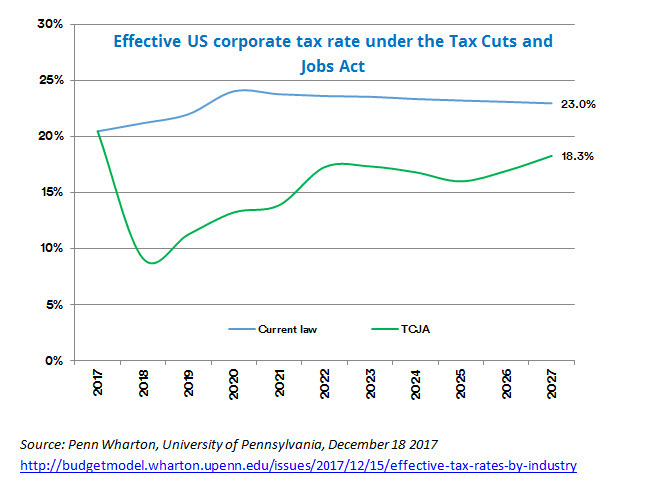 But research by Penn Wharton University suggests that over the longer-term, the implications of the tax reform may not be as drastic as they first appear. The existing statutory US corporate tax rate is 35% but due to various deductions, credits and deferrals the current “effective tax rate”, or ETR, is much lower – closer to 23% on average. Trump’s new tax regime takes the statutory corporate rate down to 21%, and with some provisions of his own the ETR falls to just 9% in 2018. However, as the chart below shows, much of the effect – more than half – is undone within 10 years. By 2027, the ETR doubles in value to 18%, mostly due to these initial provisions expiring. As investors look ahead to a new year, they could be forgiven for wondering whether they will be as pleasantly surprised in 2018 as they were in 2017. A number of political worries on the horizon this time last year signally failed to materialise, including the likely shape of President Trump’s trade policies, the rise of populism in Europe and fears over North Korea. As it turned out, the market shrugged all these aside, with both interest rates and market volatility remaining close to historic lows, while stockmarkets hit new highs. Nearly a year on, the same worries remain, compounded by the question of how markets will react to the gradual withdrawal of quantitative easing (QE). Valuations are stretched nearly everywhere, underpinned by low inflation and minimal interest rates. Japan stands out as one of the few attractively valued equity markets. In both Japan and Europe, stock prices should benefit from expanding profit margins which have room to catch up with other parts of the world. While both inflation and interest rates should rise in 2018, few foresee them getting out of hand. However, several of our investors suggest that the market consensus is too sanguine about inflation. One area of the equity market likely to stand out is value (cheaply-valued stocks). After the longest period of underperformance in over 40 years, the catalyst for a turnaround could be a rise in inflation and therefore interest rates. Assuming policymakers can successfully juggle sustaining the recovery with controlling inflation, global bonds should not experience much downside. A keen eye will need to be kept on inflation, though. In emerging markets, attractive yields for both dollar and local currency debt should be supported by continuing strong growth and relatively low inflation, alongside a stable dollar. Investors still need to beware of political developments though. In China, valuations look stretched, while growth may slow, dragged by debt reduction, particularly in the property market, and rising raw material costs, which may squeeze margins. However, domestic consumption and investment should hold firm, with selected sectors growing earnings. The overall background should be good for active managers, given a likely pick-up in both volatility and dispersion (the differences between individual stock returns), alongside a fall in correlations (the extent to which stocks move together). The challenges of managing businesses sustainably continue to grow, including the globalisation of policy, the increasing costs of misjudging technology and the ever-present background of climate change. Addressing them successfully will require an active approach. If our forecasts prove accurate, GDP growth of 3.3% in 2018 will mark the strongest period for the global economy since 2011. More important will be whether policymakers can maintain the “Goldilocks” combination of strong growth and low inflation as QE is withdrawn in the US and Europe. The main risk we see lies in reflation, as governments turn to lower taxes and higher infrastructure spending to stimulate economies, which could lead to overheating and unexpected rises in inflation and interest rates. Overall, we carry a spirit of cautious optimism into 2018, albeit that caution may start to overwhelm optimism as the year wears on. It is certainly an approach we are adopting in our multi-asset portfolios, which go into 2018 with a pro-cyclical tilt in favour of equities, but with a readiness to ratchet down risk should circumstances demand it. Demand for income remains strong but investors may be taking on more risk than they realise. We look at how to generate a sustainable income yield across asset classes. A decade on from the start of the global financial crisis, the search for yield continues unabated. Our 2016 Global Investor Survey found that 41% of respondents were seeking an income yield of at least 8% and over half were seeking at least 6%. Yet such demands look increasingly hard to meet. One particular problem is that an increasing proportion of income yield is being generated by a shrinking pool of both shares and bonds. Take bonds. Many offer “running” yields of more than 4%, on the assumption that the investor will receive back at least what they paid for the bond. Yet many – if not most – are trading above their repayment value, which means any investor who holds the bond to redemption will be guaranteed a capital loss. For example, anyone buying a bond for $105 will receive coupon payments which may equate to a 4% yield on that value, but then get back only $100 when the bond matures. So, although headline income levels (or running yield) may seem attractive, it is probably more important to focus on the “yield to redemption” that takes into account this $5 loss and is almost certain to be a lot lower. It may be possible to trade out at a better price but, even so, avoiding such losses is now much more dependent on market timing and security selection than in the past. As well as a change in price, there has also been a change in the quality of the bonds available. A historical comparison of the US dollar investment grade1 bond market makes this clear. 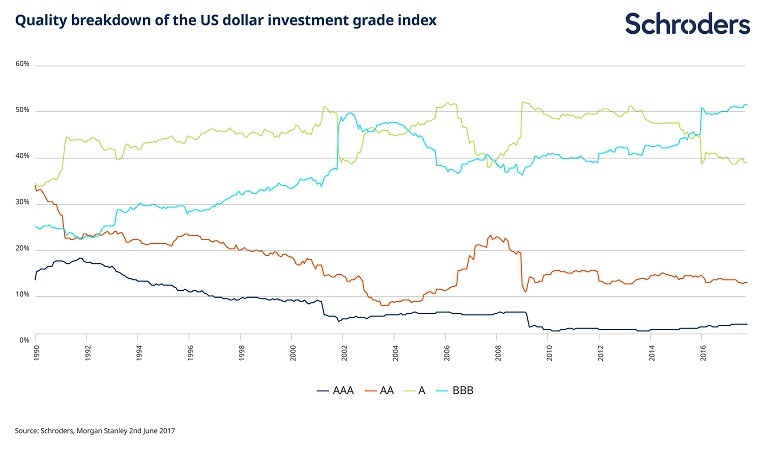 Almost half of the universe rated by credit rating agencies (which help determine the creditworthiness of borrowers) is now rated at the lower end of the spectrum (BBB), up sharply from less than 30% in the late 1990s. These changing dynamics have pushed investors towards higher yielding securities. While these are likely to be less sensitive to rising interest rates, they may be more sensitive to anticipated default rates and financing conditions as they offer less protection in the form of the lender’s financial strength. The reach for yield also leads to sector concentration. Amongst US investment grade bonds, for instance, investors who want a yield of 3.5% or higher are forced into buying commodities and subordinated financial debt2. Similar patterns can be seen in other global markets. The dependence of investors on an ever-decreasing pool of higher-yielding securities comes at a time when corporate fundamentals are beginning to look vulnerable. While most corporate borrowers can cover their interest payments relatively comfortably, the total stock of debt outstanding has been growing for a number of years. This means that the market may be vulnerable to even small moves in either global interest rates or central bank liquidity. Over the long term, dividends have provided more than two-thirds of real (i.e. inflation-adjusted) returns for US equities, and nearly 90% for UK equities. Up to now, dividend yields have held up well in most regions. With similar yields hard to find elsewhere, investors have sought out high dividend equities. Developed market companies have responded by generally maintaining their support for dividends. However, the degree of concentration in high dividend benchmarks is striking. For example, 50% of the market value of the MSCI Europe High Dividend Yield Index is accounted for by its top ten constituents. This degree of concentration is also apparent from a sector perspective, with a fifth of the yield of the global MSCI High Dividend Yield Index coming from financials alone. Worryingly, as we saw with credit, the key contributors are again financials and commodity-related. This means that investors may be unwittingly concentrating their exposures in the same areas on both the equity and the credit side. over-exposure to certain potentially vulnerable sectors and companies in both fixed income and equity markets. Our belief is that, rather than focusing on the alluring mirage of a high headline income yield, investors would be better served focusing on a more sustainable level of income. The more diversified these sources of income, the more resilient the portfolio will be to shocks. While such a focus may well result in a lower level of immediate income than is available elsewhere, the long-term prospects for both income and total returns are likely to be greater. 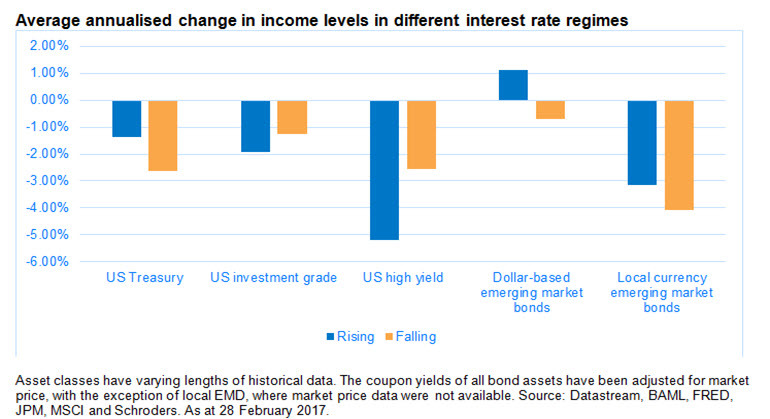 Richard draws lessons from a year that saw surprisingly large returns, falling inflation and flat long-term bond yields. The past year turned out to be more bullish than we anticipated. Consensus growth expectations caught up to ours and global earnings jumped—but the magnitude of asset returns surprised us. Most asset classes have performed well, with many delivering double-digit returns, as shown in the chart below. The events many worried about in early 2017—including the election of a far-right government in France and aggressive U.S. trade policy—didn’t materialize. The MSCI ACWI closed at a record high 61 times, and 30-day realized volatility of the S&P 500 Index hit its lowest level since the early 1960s. Other surprises: Inflation fell and long-term bond yields were flat even as the economy improved, while cryptocurrencies posted huge returns. The big stock market winners in 2017 include emerging market and Asian equities, the momentum style factor (stocks trending strongly higher in price) and the technology sector. The lesson here: Sustained, above-trend economic growth has helped companies deliver on earnings, fueling strong equity returns. All major regions increased earnings at a clip faster than 10%, Thomson Reuters data show. We expect more good things in 2018, but 2017 earnings performance will be a harder act to follow. Two other lessons: First, low volatility can be sustained for longer than many expect. Our research shows that equity market volatility tends to stay low in steady economic expansions, provided systemic financial vulnerabilities remain in check. We see no such risks on the horizon at present, notwithstanding pockets of froth in the credit markets. Second, geopolitical risks are not all created equal. It’s worth taking the time to look through what may be excessive market fears. This was our approach to Europe. The French presidential election result put fears of a eurozone breakup to rest, a “soft Brexit” appears to be emerging, and the eurozone has managed to eke out the fastest growth since March 2011. But a tougher U.S. stance to trade still looms as a major threat to the global free-trade regime. The final lessons? Low bond yields are not just about the Federal Reserve (Fed), and currencies can be wildcards. U.S. 10-year yields are broadly flat, 30-year yields lower, and the U.S. dollar down for the year—even as the economy improved, and the Fed raised rates and announced it would start shrinking its balance sheet. A soft patch in inflation is partly why. We see this dynamic reversing in 2018 as U.S. core inflation rises back above 2%. Yet we also see structural factors, including a post-crisis rise in global savings, as capping long-term rates as the Fed presses ahead with further rate rises in 2018. The bottom line: 2017 was a near-perfect year for risk assets. What’s ahead? Check out our 2018 Global Investment Outlook, and read more market insights in my Weekly Commentary. This material is not intended to be relied upon as a forecast, research or investment advice, and is not a recommendation, offer or solicitation to buy or sell any securities or to adopt any investment strategy. The opinions expressed are as of December 2017 and may change as subsequent conditions vary. The information and opinions contained in this post are derived from proprietary and nonproprietary sources deemed by BlackRock to be reliable, are not necessarily all-inclusive and are not guaranteed as to accuracy. As such, no warranty of accuracy or reliability is given and no responsibility arising in any other way for errors and omissions (including responsibility to any person by reason of negligence) is accepted by BlackRock, its officers, employees or agents. This post may contain “forward-looking” information that is not purely historical in nature. Such information may include, among other things, projections and forecasts. There is no guarantee that any forecasts made will come to pass. Reliance upon information in this post is at the sole discretion of the reader. Rick Rieder and Russ Brownback examine the more volatile cyclical dynamics we’re likely to encounter in 2018, even as the secular risk-asset bull market remains in place. Sir John Templeton famously stated that “bull markets are born in pessimism, grow in skepticism, mature in optimism, and die in euphoria.” While this thesis is often cited by investment professionals, it is also frequently used incorrectly to make a diagnosis of the contemporary investment landscape. In contrast, we apply the thesis to secular bull markets, which are multi-decade phenomena that begin with overt societal apathy and deep intrinsic value. They peak with significant societal obsession and asset overvaluation. To us, it is critically important to view every cyclical investment landscape through this secular lens. Secular investment trends are durable and tend to pull financial markets through the ups and downs of numerous smaller cycles that are embedded within them. As we enter 2018, we are firmly entrenched in a virtuous, wealth-creating secular bull market for risk that began in earnest in late 2012. It was born of the severe pessimism surrounding the existential European debt crisis, the burdensome U.S. regulatory paradigm and the demonstrable hangover from the 2008 financial crisis. But the combination of generationally low valuations, asymmetrically easy global monetary policy and ubiquitous disruptive innovation provided the thematic underpinnings. When this secular bull ultimately peaks is anyone’s guess, but that terminal point is not close in our estimation. In the meantime, an ongoing cyclical ebb and flow will cause sentiment to gyrate between optimistic and pessimistic extremes. In 2015 we entered a cyclical bear phase that evolved sequentially into the current robust risk-on cycle. Ever since, accelerating economic and earnings growth alongside dormant inflation has forced valuations to chase solid fundamental realities. However, we think 2018 is going to be a more difficult environment. Risk assets are now more fully valued, and buoyant market sentiment is more widespread. Also, the output gap has recently closed for the first time in 10 years and with no economic slack to spare, the economy is bracing for tax reform that will catalyze enhanced corporate investment. Finally, there is good evidence that wage growth is accelerating, as the economy resides near full employment. This backdrop would seem primed for the onset of nefarious inflation, but there are several powerful influences that may somewhat mitigate historical drivers of price increases. First, for the more than half the world’s population that is now online, there is effectively perfect information about economic value for nearly every imaginable good and service. Thus, with little economy-wide pricing power, nascent wage increases come mostly at the expense of profit margins. And, while new fiscal incentives will drive more capital expenditure, the traditional multiplier effect will be dampened as a portion of this is diverted into research and development. Boiling it all down, we see respectable 2018 U.S. nominal gross domestic product growth of 4.5% to 5%, with the rest of the world enjoying a synchronous growth paradigm. At the same time, visibility is murky about how a series of looming fundamental transitions may unfold. Will organic private sector growth drivers and budding fiscal policy take the baton from heretofore gushing central bank policy liquidity? Will China trade off high, but volatile, growth for slower, more stable growth while the U.S. does the opposite? In our view, simply expecting that 2017 investment themes will continue alongside of a decent growth paradigm is a precarious assumption. With the benefit of hindsight, history will judge the 2018 vintage of investment opportunities based on whether or not a new risk-off market cycle commences next year. The combination of less attractive trade entry points now, with an inherently more volatile fundamental forward environment, gives us pause. We’re opportunistically repositioning heading into 2018. For credit markets, default rates are low, but extraordinarily tight credit spreads largely already reflect that fact. Credit markets in Europe offer an especially poor risk/reward profile, as a result of omnipresent European Central Bank quantitative easing. At the same time, the recent back up at the front end of the U.S. Treasury curve has enhanced the attractiveness of shorter-dated, higher quality assets. Today, 38% of the Barclays Global Aggregate Index meets a 2% yield bogey, up from 13% last year, with most of it in the three- to seven-year bucket. Accordingly, we are migrating some of our duration exposures to the shorter part of the curve and layering in partially (or fully) rate-hedged investment-grade and municipal bonds out the curve to capture higher-quality spread. Simultaneously, with inflation likely to accelerate modestly in the first quarter of 2018, short- to medium-term inflation breakevens offer compelling upside. With leveraged credit looking especially full, we favor emerging markets (EM) debt and certain parts of the securitized markets instead. EM fundamentals remain in a disinflationary growth sweet spot, which is likely to facilitate further EM-developed market rate compression. Finally, we still see a place for equity in portfolios today, albeit in smaller allocations and mostly in expressions that take advantage of inexpensive right-tail convexity. As 2017 comes to a close a long secular bull cycle for risk is firmly entrenched, but it may be interrupted in 2018 by a healthy cyclical correction. The combination of full valuations, rising fundamental uncertainty and central banks that are proactively removing accommodation dictates the need for a more cautious posture next year. Rick Rieder, Managing Director, is BlackRock’s Chief Investment Officer of Global Fixed Income and is a regular contributor to The Blog. Russell Brownback, Managing Director, is a member of the Corporate Credit Group within BlackRock Fundamental Fixed Income and contributed to this post. The pace of significant political and economic events seems to have picked up over the past couple of years, and there is every indication that this will continue next year too. Without a doubt, these events can be seen as aftershocks of the financial crisis, and it is therefore quite reasonable to expect these will continue into next year. In the US, President Trump’s appointment of Jerome Powell to replace Janet Yellen as Chair of the Federal Reserve was greeted with relief all round. In response, US Treasuries went up, despite strong economic growth and a higher than expected proposed tax cut of $1.5 trillion. With net debt of $16 trillion, what’s another trillion more? So far as US interest rate policy is concerned, it now looks like one more increase this year and three or four next, returning rates to a more normal 2.5%, if all goes to plan. In late October, the European Central Bank decided to extend quantitative easing for a few more months than expected, despite respectable growth and signs of inflation. The President of the Bundesbank expressed his concerns about too much support having adverse consequences in the longer term, but was ignored by investors, who sold the euro and bought both equities and bonds. It is interesting to note that monetary policy outweighs political strife in Spain, although perhaps it is early days for this particular crisis. The US, China and Japan, together with the EU, are all moving ahead helped by supportive monetary and fiscal policies. But what next? We might start to suffer from too much of a good thing at some stage during 2018, and see inflation driven higher by too much demand and not enough supply. If this happens, we will look back at 0.25% interest rate rises with wistful affection. For now, however, the present seems good enough. In the UK, despite doubts about the stability of the British Government at a time of mounting Brexit uncertainty, a survey of UK recruitment consultants reported both an increase in permanent placements, and also that these recruits were able to secure higher pay. A Bank of England survey concurred: it seems that those with the right qualifications are in short supply and so can ask for higher pay. As employers look to hold onto their staff, so pay increases are being considered ahead of an expected rise in inflation. Over the decades, we have become used to making decisions based on a western framework. Since the financial crisis, this has become an increasingly risky assumption. The centre of gravity of the global economy is shifting and, as it does, we can see the growing influence of non-western money, where decisions are being made using a different rule book. Unsurprisingly, perhaps, the top two performing asset classes so far this year are the MSCI Frontier Markets (26.7%) and MSCI Emerging Markets (23.4%) (source: Datastream, YTD as at 9th November 2017), with the growth forecasts for Emerging Markets and China outstripping all other regions. In the Far East, North Korea’s missile rattling continues to grab the headlines, while its neighbours go about their business. In China, we have seen President Xi Jinping confirmed in power for the foreseeable future, while managing a transformation of the country’s prospects. The mandate from on high is now for ‘balanced growth’, rather than ‘growth’, which suggests that economic policy will now be directed towards achieving sustainability rather than debt-fuelled growth at any price. It is what the Chinese are good at: combining change with stability. Japan continues its corporate renaissance, so that 60% of earnings now come from abroad and innovation has been brought in. Earnings growth is largely responsible for the market re-rating that we are now seeing in Japan. In the Middle East, the long-simmering tension between Saudi Arabia and Iran, the two key players in the region, has suddenly escalated. Saudi Crown Prince Mohammad bin Salman has locked up senior members of the establishment, disturbing the carefully cultivated equilibrium we have come to expect of the kingdom. He has also forced the resignation of Lebanese Prime Minister Saad Hariri, for reasons not declared but likely related to the proxy wars going on in Syria, Lebanon and Yemen between Sunni (Saudi backed) and Shia (Iran backed) forces. The importance of these dramatic developments is that approximately 20% of global oil production is transported through the Persian Gulf, which separates Saudi Arabia and Iran. As yet, it seems the markets have ignored the increased geopolitical risk that these events represent, though this could now more easily change, with real implications for the global economy. Barring a political shock, monetary policy error, investor over-confidence or a credit event, the outlook for 2018 can be regarded as positive. The bull market scenario is based on economic fundamentals that still look supportive; corporate valuations and profitability are reasonable; and, with equities attractive relative to other assets classes, investor confidence is increasing modestly. At some stage, economic growth with low inflation might be too much of a good thing. As the end of 2017 comes in to sight, against a backdrop of relatively high stock valuations, rising interest rates and innovation disrupting established business models, due regard must be given to the basics of investment life: with deposit rates still close to zero, not being invested is bad for your income; innovation creates winners and losers, even if index volatility is low; and, most importantly, long-term investment success comes from having the flexibility to meet the challenges of a changing world. Your financial future is not something to be left to chance. It demands a well-constructed, goal-oriented investment portfolio. In a world of increased market risk, policy uncertainty and an outlook for lower long-term returns across asset classes, how well you build your investment portfolio matters like never before. It can mean the difference between a comfortable or a compromised retirement. Contrary to common belief, portfolio construction is not a simple matter of choosing asset classes/securities—stocks for growth, bonds for income—and assigning some mix of the two. It’s important to understand how the various components work together, how they might be expected to perform over a given time horizon, the correlation between them and what risks might be embedded in them. 3 questions you should ask yourself before you start on the process of constructing a portfolio that can address your financial needs and goals. This statement may seem obvious, but many investors fail to orient their investments by objective. To begin, assess: (1) how much you have, (2) how much you need at some point in the future, and (3) how much your investments need to earn. The tougher question: Is my objective actually achievable? In other words, is that required rate of return possible given the timeframe and expected market conditions you are working under? Consider: How probable (or improbable) is it, and how much risk might you need to take in order to pursue that return. Ultimately, the answers to these questions will help you understand if your goal is a reasonable one, or if your timeframe or expectations may need to be adjusted. What type of risk am I able and willing to accept in pursuit of those goals? In the industry, we often quantify risk as a mathematical concept, such as standard deviation. But we are keenly aware that, for investors, risk is emotional. And that can be hard to plan for. Often, the framing of risk can make all the difference. Imagine that a €100,000 investment in an asset with an annualised level of volatility of 10% could easily undergo a drawdown of €10,000 in any given year. Assessing your tolerance for risk and capacity for loss, if any, is probably not about whether 10% volatility feels OK to you. It’s about the more tangible question: Can I bear a loss of €10,000 in value of my investment at any moment in time? Equally important: Know the risks you are taking. Nothing removes the emotion from investing, but having confidence in what you have built can sometimes help you to stay the course and not let stressful periods derail the pursuit of your goals. What am I willing to pay in this pursuit? Portfolio costs come in two categories: fees (transaction costs or management fees) and taxes. Each of these eat into the returns a portfolio generates. That drag is intensified in times of low returns. Being wise about your cost budget means considering how low-cost exchange-traded funds (ETFs) might work together with high-conviction active strategies. In short: You want to consider where it makes sense to pay more for manager skill and high-conviction ideas vs. gaining broad market exposure with index-tracking investments. 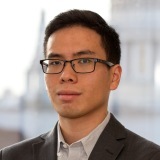 For example, if an active manager has displayed an ability to outperform the benchmark by 1% over time, and you only pay 0.5% extra in fees and taxes in order to achieve that return, then that trade off might be worth making if you believe the manager can continue to deliver at that rate. If you can’t identify a manager offering this kind of benefit, then it may make more sense to opt for the broad market exposure at a low cost. While these are three seemingly simple questions, they require hard thought to arrive at meaningful answers around which a productive investment portfolio can be built and oriented. Working with a Certified Financial Planner can bring objectivity and expertise to the conversation. It might also bring some peace of mind. Research shows that investors who work with a Certified Financial Planner feel more confident and better prepared for their financial future. Your life goals deserve that much. No questions asked. Investing involves risks, including possible loss of your capital. The value of your investment can fall as well as rise and you may receive back less than your original investment. This material is not intended to be relied upon as a forecast, research or investment advice, and is not a recommendation, offer or solicitation to buy or sell any products or to adopt any investment strategy. The opinions expressed may change as subsequent conditions vary. As such, no guarantee of accuracy or reliability is given and no responsibility arising in any other way for errors and omissions is accepted. Reliance upon information in this post is at the sole discretion of the reader. All of us have worked hard to build capital and are looking to preserve and grow the real value of our assets, but when it comes to investing that money we often fall foul of simple mistakes that impact our ability to invest wisely. When markets are rising, it is easy to get carried away, but the longer we move on from the last downturn the more we tend to forget the mistakes of the past. Each investor is responsible for making all of the investment decisions in relation to his or her pension. These decisions may not be correct. As a result, there is a risk that the pension may be under funded by the investor and/or the value may be insufficient at retirement so that the investor’s long-term retirement needs may not be met. It is important that each investor seeks independent professional advice prior to making any decisions which have tax, legal or other financial implications. One of the major potential dangers to an ARF is what is known as Bomb out risk: there are various descriptions of Bomb out risk but the most prevalent description is that an investor who takes regular withdrawals and/or imputed distributions over the life of their potentially run the risk that your income needs may no longer be met by the value of your ARF. This product is not suitable for regular large income withdrawals which can deplete the fund. The value of the investment may go down as well as up. Investors may lose some or all of the money invested. There is no guarantee that the ARF will meet its objectives of long-term capital appreciation or the level of income required. Unit values may fall as well as rise. There is no guaranteed investment return. Past performance is not a reliable guide to future performance. The ARF may be invested in particular securities, such as stocks or bonds, which can fall in value at any time due to the value in global stock markets. The ARF may have exposure either directly or indirectly to non Euro currencies. Currency movements may impact negatively on the overall performance of the pension product. Investments may be adversely affected if any of the institutions with which money is deposited suffer insolvency or other financial difficulties (default). The ARF may be invested in securities which cannot be easily sold in the market at a fair value and therefore cash may not be available to the investor when needed. ARF’s are a long term investment and the effect of inflation can erode any ‘real’ investment returns over time. Losses may occur if an organisation with which the fund transacts becomes insolvent or fails to meet its obligations. This risk may be reduced by obtaining assets as collateral from these organisations. These losses will be passed on to the investor. The ARF and/ or any underlying investments in funds can be subject to investment management risk, whereby there is a risk that there will be a financial loss due to the investment manager making the wrong investment decisions. The investment manager may choose the wrong asset allocation or specific stock selection or overall investment strategy. Tax laws and regulations are constantly changing, and they may be changed with retrospective effect which may have a negative impact on pensions or underlying investments. No assurance can be given regarding the actual level of taxation that may be imposed upon pension schemes or underlying investments. Any tax information that may be provided for Irish resident clients is based on our current understanding of the tax legislation in Ireland and the Revenue interpretation thereof. It is provided by way of general guidance only and is neither exhaustive nor definitive and is subject to change without notice. For long-term investors, dealing with volatile markets can be taxing and at times quite frightening. The accumulation of Pension & Non Pension Capital has taken time and effort to accumulate with a desire to ensure positive as opposed to negative growth is achieved on same. Here are some points you may want to consider in such Market conditions. None of these should be new to you, but they are particularly important in a turbulent environment, which is where their true value is realised. Don’t panic — When Investment markets become volatile, the gut reaction for most of us is to panic — to buy when everyone else is buying (and when prices are high) — and panic sell on the downside (when prices are depressed). Panic selling also runs the risk of missing the market’s best-performing days. Consider, for example, an investor missing the top 20 performing days of the S&P 500 in the last 20 years would have reduced the average annual return from 9.79% to 3.58%. Whilst not advocating 100% allocation to Equity, this point highlights the necessity to ensure correct Assets and Allocations are held within a Portfolio and also an understanding that returns WILL be both positive and negative over time. Pay attention to asset allocation — During volatile times, riskier asset classes such as Equities tend to fluctuate more, while lower-risk assets such as Fixed Interest Bonds or Cash tend to be more stable. Ensuring a balanced and risk adjusted structure to your Portfolio will entail a greater ability to ‘weather ‘volatile market conditions. The necessity for regular reviews of your holdings will ensure a clear and transparent understanding of the risks being undertaken. Diversify, diversify, diversify — In addition to diversifying your portfolio by asset class, you should also diversify by sector, size (market cap), and style (e.g., growth versus value). Why? Because different sectors, sizes, and styles take turns outperforming one another. By diversifying your holdings according to these parameters, you can potentially smooth out short-term performance fluctuations and mitigate the impact of shifting economic conditions on your portfolio. Keep a long-term perspective — It is all too easy to get caught up in investment market’s daily roller coaster ride — especially when markets turn choppy and its effect on your Investment Portfolio can reflect such movement. This type of behaviour is natural, but can easily lead to bad decisions. Instead, focus on whether you continue to be comfortable with your long-term performance objectives based upon informed and current commentary. as an investor, time may be your best ally. Consider using it to your advantage by sticking to your goals and ensuring your plan is constantly current. We hope the above gives some element of direction on how invested Capital should be assessed in volatile conditions. The message we hope to convey is the need for regular review and assessment to ensure Invested Capital is working for you. For investors with a medium to long-term investment horizon, investing in high-yield equities (high dividend paying stocks) is certainly something to be considered. For investors with a medium to long-term investment horizon, investing in high-yield equities (high dividend paying stocks) is certainly something to be considered. For those of us that invest in global stock markets, we do so with the expectation that we will make money in the medium to long term. A global approach gives portfolio managers the flexibility to pursue what they believe to be the best investment opportunities in the world and provides an important source of portfolio diversification in the process. Dividends can also have a significant impact on returns and the reinvestment of these dividends within a fund structure can be of benefit to a portfolio. to grow that dividend in the future. • High and stable return on shareholder equity. This process reduces the number of stocks down to less than 300, and the risk overlay narrows it further to approximately 170. The risk overlay from the Fund Manager is an important step in the process, identifying stocks that may need to be excluded for qualitative reasons. The model is consistently applied to ensure stability; however, it has been assessed and refined at several points since the fund’s inception. The screening process takes place on a monthly basis. In order to reduce unnecessary turnover in the fund, the criteria are set such that it is more difficult to get into the fund initially than it is to remain within the fund once previously selected for inclusion. The initial stock screening takes place on the global universe (focusing on points above). The exposure in the sector also has a wide geographical spread; however the sector components are generally highly correlated, particularly in times of weakness. Zurich’s model helps identify stocks that have the potential to grow their dividend, and is not focussed on only equities that are considered ‘defensive’. It is important to note that not all dividend stocks are defensive by nature, and dividend growers tend to be more cyclical. By having a model that uses a number of different metrics, and an active manager overlay, the fund is well-positioned to identify stocks that have the potential to participate further in the global economic recovery. The outlook for the fund continues to be positive; the robust nature of the model – combined with the manager overlay – has produced above average returns. Whilst the long-term downward trend in bond yields appears to be coming to an end, investors looking for an investment with an income stream may not be satisfied with bond yields that are still currently well below historical norms. Stocks providing a dividend yield continue to offer an opportunity to provide this income stream. As part of a wider portfolio the Dividend Growth Fund aims to help provide better investment outcomes.